I didn't plan at all on making violet jelly, yet by the end of the day today I had a small batch, resting proud and purple, on the towel lined square of counter nearest to my stove top. An unusually warm March has given way to more seasonal cool this April, and we've finally gotten some rain as well, washing the tender violets and greening up my neighborhood with supernatural aplomb. Spring never ceases to amaze me, that the seeming dead of tree and flower suddenly, prolifically, burst out into full bloom - reminding me on an annual basis that I love living with four distinct seasons. 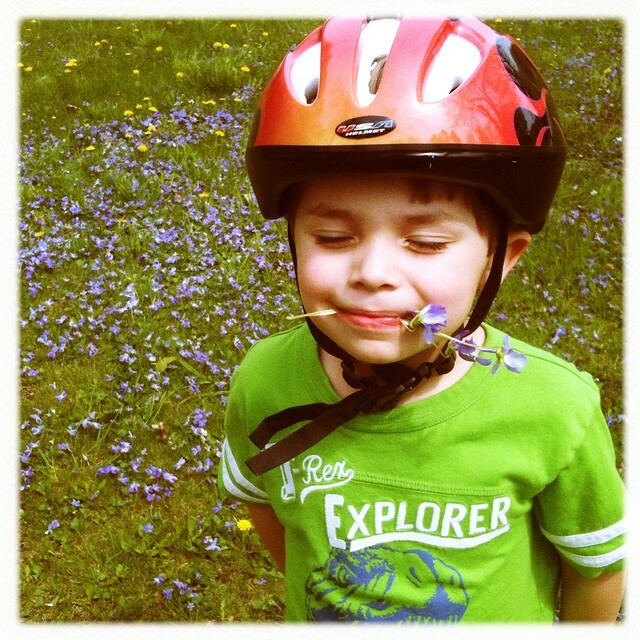 My kiddo has gotten his first two-wheeler bike, and ever since I told him that violets are edible and we can eat them, he stops his ride at every plot of them to peruse a perfect, edible specimen. This child will not eat one single morsel of lettuce leaf or other green, but purply violets? He not only eats them, but then sings the song he learned in school to remember the colors of the rainbow, emphasizing the word "violet" with proper gusto... The funniest thing is that he doesn't really like them, he is just excited to eat something that doesn't appear at first glance that it should be eaten. I even got him to eat a sliver of bitter dandelion green, of which he declared that he didn't really like it but was glad that he tried it! 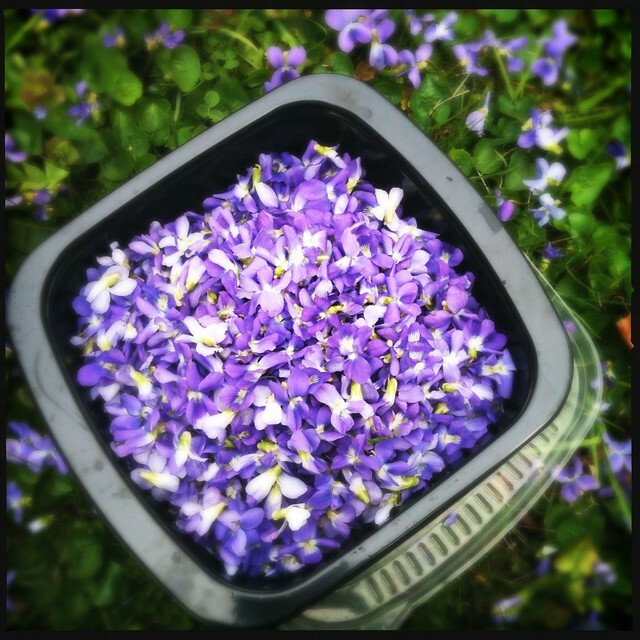 While I know in my head that violets are edible, I have to admit I am an intrepid forager. Foraging is something I prefer to learn firsthand, where book knowledge is something I might read and remember, I don't think I would rely on without first comparing with visual human knowledge. I convinced myself that violets are probably impossible to mistake, and that also a little empty lot of land strewn with both them and ample dandelions is probably as close to pesticide free as I'll get in an urban local. I spent maybe 20 minutes kneeling in the grass, soaking up a little sun before swirling winds and rain clouds boisterously interrupted the afternoon. I picked mostly purple violets, a few lighter specimens for accents, easily and therapeutically after I discovered how to turn both hands into discriminating rakes. Then I walked home and soaked 2 packed cupfuls of them in 2 cups of boiling water. I let them rest nearly 24 hours before straining them. 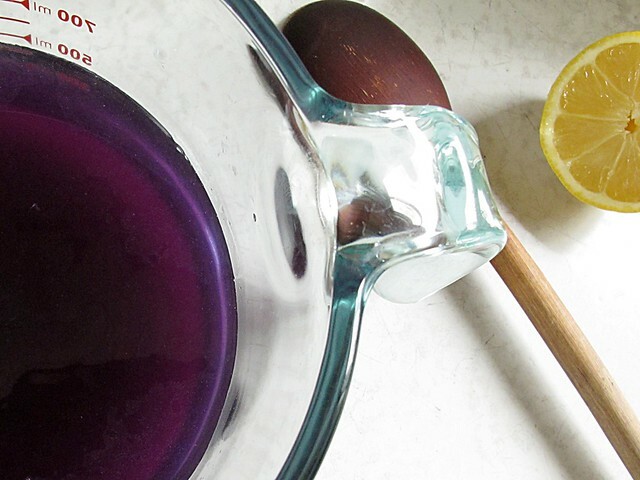 The water was a deep indigo until I added a lemon and a half's worth of juice, which according to multiple accounts I read of violet-jelly-making I had expected to turn a shocking, brilliant purple. 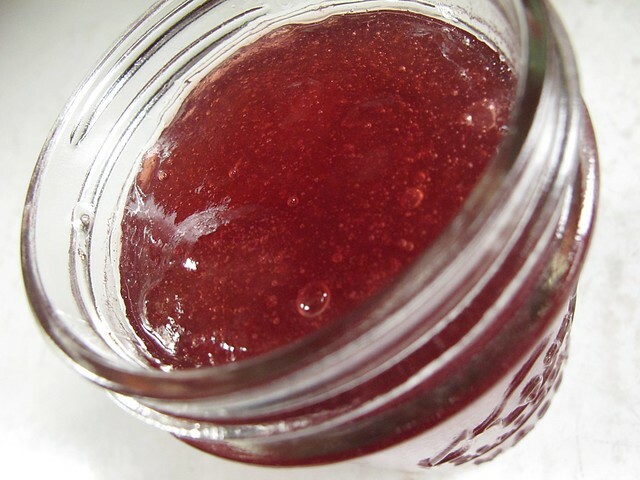 The only sugar I had on hand was raw cane sugar, which I usually substitute by weight measure for canning, and I knew the purple would be diluted by its darker amber color. It's still a pretty shade, but less surprising and more just plain "grape" colored than if I had used a pure white sugar. I'm actually not much of a jelly maker. 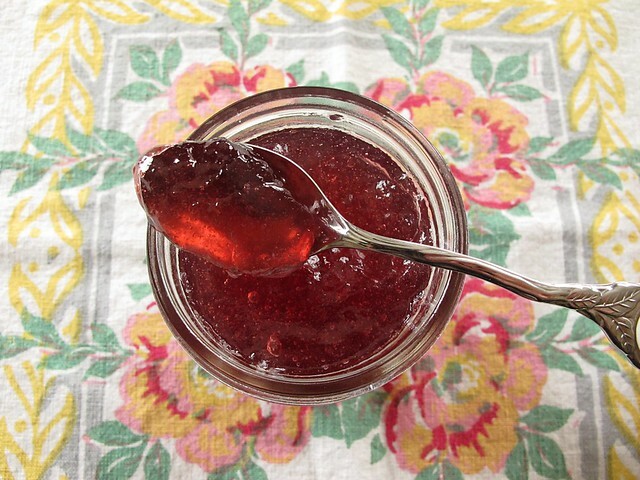 Last year, I made wonderful watermelon and grape jellies, but I am far less confident with jelly than I am with jam. I am also not so finicky that a little cloudiness bothers me, so frequently my jelly has a rustic feel that true jelly connoisseurs may scoff at. I also forget that liquid pectin is a far superior product to the powdered type, and I also forgot that I made some homemade apple pectin that I had stashed in the freezer last fall. Any future batches of violet jelly will be made with both white sugar and liquid pectin, since my first attempt was far from perfect. But for using ingredients that were on hand and growing out in the neighborhood, this pretty, cloudy, slightly herbal jelly is pretty nice. 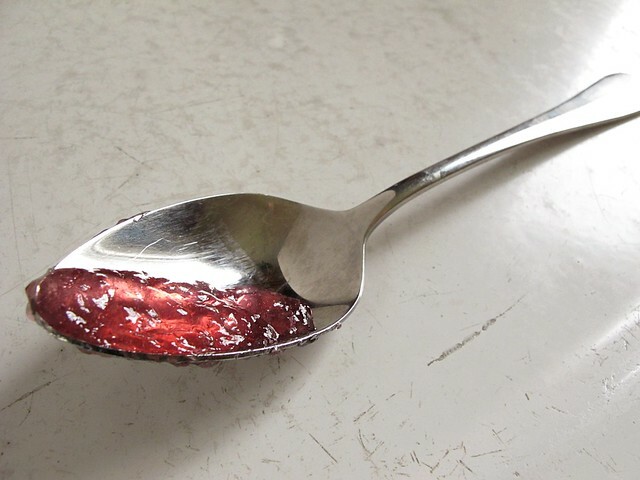 I have likened it to the stone soup of the jelly world, because the violets were very mild in my case, the overall flavor of the jelly is very good, and it was nearly free to produce. It has deep, caramel undertones from the raw sugar, and bright lemon highlights. The texture, while imperfect, is almost pudding-like and I think it will find a happy home in a yellow layer cake (or at least my imaginings of one, since I have really been doing well not consuming lots of dessert...). One other highlight of my day today was spending the morning with a new friend, Marisa, who I traded my gently used yogurt machine for some tofu coagulant and a new Greek yogurt culture. I let my old favorite, the viili culture, pass gently away to make new room for a thicker, Greek culture, and maybe as soon as lunchtime tomorrow I'll be able to spoon a bit of this new jelly into some fresh yogurt for a true test of its eatability. It would have been nice if yesterday I had felt like sitting still long enough to paint egg whites over the remaining violets and dust them with sugar. I read a quick article by Linda Ziedrich which outlined the simplicity of it, but for some reason I couldn't gather the patience to sit with them for another hour. I couldn't help imagining a fat shortbread cookie with an appropriately sized indentation for violet jelly, topped with a sugared violet garnish. But that amount of detail is now alive only in my mind, maybe to make a Springtime appearance once upon a time in a bakeshop I may never own. PostScript: If you wonder what recipe I used, it was this one (it was credited to being available all over the Internet), and instead of the white sugar, I used 766 g. of raw sugar. I also used lemon juice from 1 1/2 lemons, since the lemons I had on hand needed using and the first half I squeezed smelled so good I couldn't resist. My yield was 3 half pints, 1 quarter pint and one nearly full half pint that I considered run over so I could enjoy it immediately. If you too are a first time violet jelly maker this year, let me know what you think of the flavor, and if you have better luck (texturally speaking) with a liquid pectin set!